Rumi, ‘revered as the friend’, his poetry always inspires my journey, at this moment three years after my beloved made his journey to the river of stars, each of these words whispers a message to me. That night we wept, and we laughed. I remember the first time I laughed after Bill died. The sound, the sensation felt strange, even foreign, yet laughter was such an expression of our love for each other. I had forgotten how to laugh in the grip of grief. Laughing was bittersweet. I felt and continue to feel, as I walk on this path of grief and love, the fierceness of the lion and the tenderness of the evening star. These sensations, these emotions carry me to the stars to be with him and ground my feet to the earth so that I may look up to the night sky and see him in the river of stars. The power of love washes over me gently, as a rain shower, and fierce like raging rapids, guiding me to unknown shores. This water that cleanses and carries me is the power of my tears. The release of my tears is sacred, I realized they are a safety valve for my heart. The watershed of tears becomes an ocean of remembrance for the beloved. I dive deep into those sacred waters and do my best to let the currents take me. I was in shock, and too numb to plan his ceremony so soon after he died. But I wanted to give him what I thought then, was one last gift to go with him on his journey. My beloved sister, Treeka and I lovingly prepared a pair of moccasins he wore on his earth walk. We filled them with treasures Bill and I collected at the ocean and in nature over the decades, adorned with crow and hawk feathers to give him flight, and beautiful fresh white sage to swaddle him in sacred scent. We wrapped them in some fabric from one of his favorite blue shirts. I placed them on the sand in the direction that he was now traveling toward the stars. There was something mysterious, symbolic seeing an imprint of his feet, making their way to the sky. 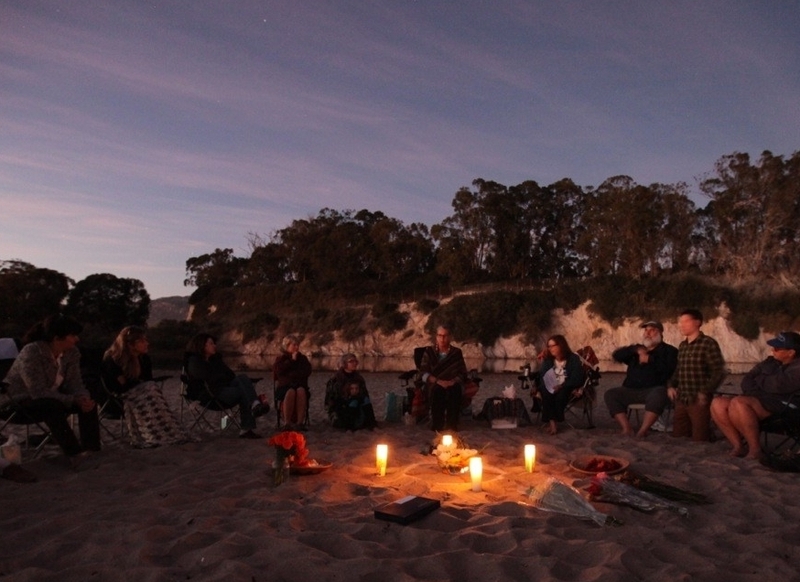 They sat there all evening receiving the infusions of love, stories, songs and prayers shared during the ceremony. Every year on his birthday I would ask him what he wished for and it was always the same, he wished for peace. Peace in the hearts of all people everywhere, peace for our Mother Earth and all her children he loved so dearly. He was cremated with his spirit bundle gift and I prayed that peace went with him. The photos I’m sharing with you are from the ceremony for my beloved Bill, just four days after he made his spirit flight to the stars. I could say I don’t know how I led that ceremony, but it led me, and our love guided every word, gesture and ritual offered. He was in all the in-between spaces, silent and unseen yet present like the setting sun, the moonrise and the stars appearing in the night sky. Much like he was in life. His entire life path was whispering in the calm wind that evening, flickering in the candlelight, the birds’ flight as they gathered for the setting sun, the sound of the waves washing in and out at the shore. He was also ever-present in the faces of the ones he touched during his life walk, and in the stories as they shared. We were at the ocean where he and I had just walked the weekend before. Our footprints were offered to this holy ground countless times on our walks together. He would hold my medicine pouch as I would offer prayers to the ocean. He stood behind me, the waves coming up to receive the prayers. 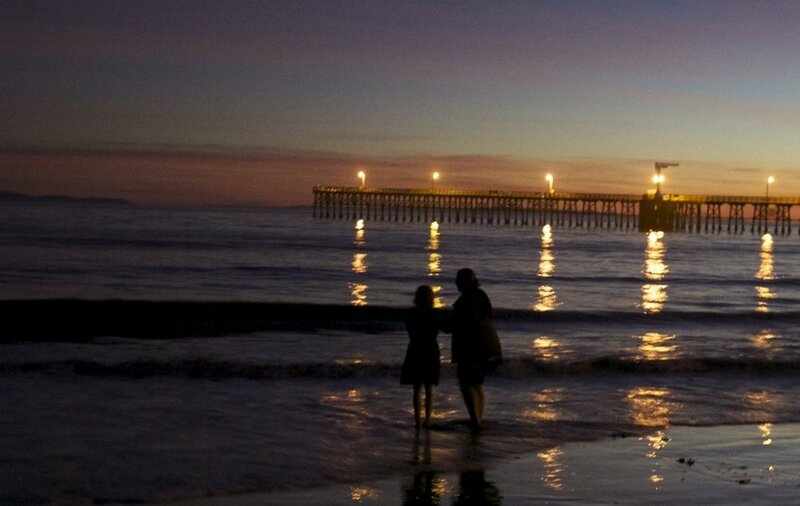 I would turn smiling at him, we would hug and continue walking down the beach. Nothing needed to be said. Just a simple and profound gratitude to be in love, to love and to be together. During our ceremony, he was as present as when I would turn smiling at him after I offer prayers to our Mama Cocha, Mother Ocean. Now he was everywhere, he was everything but invisible. The ceremony gave all of us gathered a way to share our stories honoring his life gifts as they spoke to each of our hearts. But it was also for him, to send our love and prayers for his journey back to the river of stars. The prayers and our hearts our palpable from the images. The ways in which our Mother Earth, the trees, the birds, the water, the sky, the clouds and the moon gathered with us, speak to the magic and mystery of being together in ceremony. Death lifts the veils between worlds and shakes us to our bones. We are raw, we are vulnerable, we are shattered. Our flesh has been stripped away and what remains are the bones. The bones take us back to the ancient ways when our bones were revered. Our bones connect us with Spirit. A community would sit around the fire and honor the one who had died, and each other. They drank the grief medicine from their river of tears. Their river of tears became the river that the loved one traveled on to the river of stars. We were a tribe that honored each moment of the dying journey with love, respect, and compassion. We were hollow bones so that Spirit could move through us, and show us the sacred ways of sending our loved ones back to the stars, knowing that one day it would be our turn, and our tribe would gather for us and honor our journey, and our loved ones would be there to guide us home. Death and living are holy pairs, helpmates, part of a unified whole. Just as Bill and I were helpmates, soul mates during his earthly pilgrimage. Now we are in all worlds, he is my star mate. Death can awaken in us the passion for living. A sense of aliveness infused with the love and beauty of the one we love, when we surrender to our grief. The hole, the void I feel from his loss is never filled. It is becoming a hallowed ground, where I can place my grief, sadness, love and I know he receives me. I know the love that we were, that we continue to be receives the gifts that I open on this journey. Death awakens us as a community to regather our tribe and simply be here for each other. Death and grief are as natural as breathing but we have forgotten. But ceremony beckons us to walk back through the threshold of losses with love. "We are stars wrapped in skin – the light you are seeking has always been within. . . Lose yourself completely, return to the root of the root of your own soul. . .
Don’t run away from the grief, O Soul, look for the remedy inside the pain. . . There is a sacredness in tears. They are not the mark of weakness, but of power. . .